FARMERSVILLE – After 10 years of parking its plan for a new public safety station, the City Council is now putting the plans into motion develop a block of central Farmersville for a transit station as well. 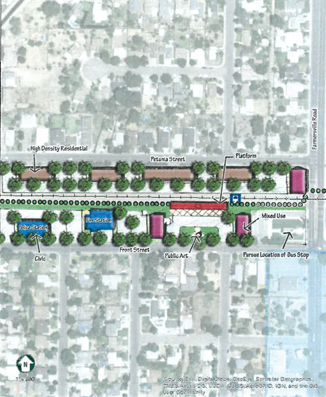 At its Oct. 8 meeting, the Farmersville City Council gave consensus to its engineering firm, QK, and its transportation authority, the Tulare County Association of Governments (TCAG), to plan a transit center on a block of property on Front Street south of the railroad tracks. The proposed site was selected for its location along the railroad tracks which are part of a plan to create a new passenger railroad connecting cities in Kings and Tulare Counties to the High Speed Rail station in Hanford. On June 18, TCAG, which oversees Tulare County transportation funding and projects, voted to approve the Cross Valley Corridor Plan (CVCP) converting 75 miles of existing freight rail into passenger rail between Huron in southwest Fresno County to Porterville in southeast Tulare County. The CVCP parallels portions of State Routes 198 and 65 linking the cities and communities of Huron, Naval Air Station Lemoore, Lemoore, Hanford, Goshen, Visalia, Farmersville, Exeter, Lindsay and Porterville. Unincorporated communities of Armona and Strathmore may also be served by transit stops. The Kings/Tulare high-speed rail station is located in the center of this corridor near the intersection of State Routes 198 and 43. Located behind the white chapel museum, the site may also include a bus station, bike paths and pedestrian walkways. There will be two bus bays, a parking lot, two electric car chargers and a possible train station platform for the Cross Valley light rail. The estimated cost for the project is between $3.7 million and $5 million. The City along with TCAG will be looking for funding to pay for the project. Potential funding sources include USDA Rural Development, US Department of Transportation, CA Housing and Community Development and Caltrans. The City purchased the property in 2008 and designated the centralized location for a new joint police and fire station. Both departments are currently housed at the Farmersville Civic Center located on Visalia Road on the western edge of the city. Last November, the City Council applied for a $5 million grant as part of the 2017 Community Development Block Grant (CDBG). Issued through the California Department of Housing and Community Development, the grants can be used to provide homeownership assistance and rehabilitation, public service programs, planning studies, economic development assistance and public facility projects. More than $4 million of the grant was requested to build a new fire station and a purchase a new fire truck. Farmersville has needed a new fire station since 1995. A plan for a new fire station was completed in 1997, and identified the property on Front Street just west of Farmersville Boulevard along the railroads tracks as a possible location for a new fire station. Farmersville’s old fire station on Ash Street was built in the 1940s and is in bad shape. Even the smallest engines can barely clear the bay doors. Mayor Pro Tem Matt Sisk felt the project would be good for the City’s future.